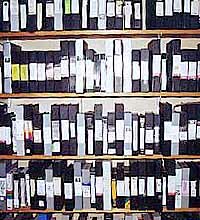 Thousands of original videotapes created by pioneering individuals and organizations are held by organizations throughout the US. The works offer many possibilities for research, scholarship, education and public programming in the arts, social sciences and humanities. This historical and cultural legacy remains largely unknown outside the media field. Access to early video work remains limited, and the works are rarely programmed outside of major arts institutions. The works in many collections are in need of cataloging and preservation, before efforts can be made to make them publicly accessible. Texts - Read texts from the biblio database describing the evolution of distribution strategies and the changing structures and methodologies devised by individuals and groups for making the work available. Collections & Distribution links - Organizations maintaining public collections or providing distribution of videotapes, and which emphasize early historical works are listed here.